We aimed to assess the relationship between bone scintigraphy findings and prostate-specific antigen (PSA) and Gleason score in a group of treatment naïve West Africans with prostate cancer. The age, PSA, and Gleason scores of 363 patients with prostate cancer were collected. Patients were risk stratified using the D'Amico criteria. Logistic regression was performed to assess the relationship between bone scan results and PSA and Gleason score. Receiver operating characteristics (ROC) analysis was used to determine the diagnostic reliability of the bone scan findings. Ninety of the 96 patients with metastases had high risk, and only 6 had low-to-intermediate risk disease (P = 0.0001). PSA (odds ratio [OR] 2.4 [95% confidence interval [CI] 1.5–3.8], P = 0.001) and GS (OR 2.2 [95% CI 1.5–3.1], P = 0.001) were independently predictive of the presence of metastases. ROC analysis revealed that PSA predicted the presence of metastases with an area under the curve of 0.72, and using a cut-off value of ≥20 predicted metastases with a sensitivity of 86.5% and specificity of 41.2%. A Gleason score of ≥7 had an 89.6% sensitivity and 34.8% specificity for bone metastases. Using a Gleason cutoff of ≥8, the sensitivity and specificity for predicting bone metastases were 54.2% and 71.5%, respectively. The area under the Gleason score ROC curve was 0.68. PSA and Gleason score are independent predictors of the presence of bone metastases in West Africans with prostate cancer. Serum prostate-specific antigen (PSA) level, Gleason score, and tumor, node, metastasis clinical stage have been shown to predict the likelihood of lymph node metastases in surgically staged patients diagnosed with prostate adenocarcinoma. Studies have reported that serum PSA, clinical T stage, and Gleason score are independent predictors of the presence of metastases on bone scintigraphy.,,, There has been no previous study on the relationship between these clinical parameters and the staging bone scintigraphy findings in Ghanaian patients with prostate cancer. In Ghana at present, there is only a single nuclear medicine center located in the capital city, Accra. In this paper, we review the results of patients with prostate cancer who were referred for staging bone scintigraphy at the center and to examine the strength of the association between Gleason score and PSA and the likelihood of metastases on a bone scan in Ghanaians with prostate cancer. This was a retrospective study conducted at the Nuclear Medicine center of the Korle-Bu Teaching Hospital in Ghana. Being the only functioning nuclear medicine service in the country at present, the center receives referrals from public and private hospitals in the entire country. The majority of referrals for bone scintigraphy, however, emanate from the Korle-Bu Teaching Hospital. We searched the archives for all patients with prostate cancer who had bone scintigraphy. The study population comprised all patients with histologically confirmed prostate cancer referred to the center for bone scintigraphy during the period January 2016–December 2017. We included patients in whom the procedure was performed for disease staging. Patients with prostate cancer who had bone scintigraphy performed for reasons other than staging and those who were not treatment naïve were excluded from the study. Serum PSA, Gleason score, and other clinical information were abstracted from the clinical records and physician referral forms. The upper limit and lower limits of detection of the PSA assays were 4 and 0.4 ng/ml, respectively. Patients were risk stratified using the D'Amico criteria. Low-risk prostate cancer was defined as PSA ≤10 ng/ml and/or Gleason score ≤6. Intermediate-risk prostate cancer was defined as PSA 10–20 ng/mL and/or Gleason 7 disease. The high-risk disease was classified as having any one of the following high-risk features PSA >20 ng/mL and/or Gleason score of 8–10. The nuclear medicine center performs bone scintigraphy procedure and image acquisition in line with published International Guidelines., On the day of bone scan acquisition, each patient was injected intravenously with between 15 and 25 mCi (555–925 MBq) Technetium-99 m methylene diphosphonate. This was then followed 2–5 h later with the acquisition of anterior and posterior images, either as a WB sweep or static images with a single head Siemens ECAM SPECT camera (Siemens Corporation, Germany). A low energy high-resolution parallel-hole collimator was used in the acquisitions with the energy window centered on the 140 keV photon energy peak, and a window width of 15% was used. WB images were acquired with scanning speed of between 15 and 20 cm/min and an image matrix of 1024 × 256. Static planar images or spot views were acquired for 3–5 min each using a matrix size of 256 × 256. Detailed images or extra spot views were acquired as and when necessary; depending on the findings of the scan. The results of the bone scans were obtained from the official reports, and these are the interpretations of the nuclear physicians working in the center who applied the criteria for the presence or absence of metastases. Data are presented as frequencies and percentages or as medians/range as appropriate. Gleason score and serum PSA were evaluated by logistic regression analyses for their ability to predict the presence of metastases on bone scan. Patients were grouped as follows: Gleason score ≤6 versus Gleason score 7 versus Gleason score ≥8; PSA <10 versus 10–20 versus >20. The Gleason and PSA cut-offs used were as proposed by D'Amico et al. and used in routine clinical practice by our urologists. We used receiver operating characteristics (ROC) analysis to assess the diagnostic reliability (sensitivity and specificity) of various PSA and Gleason cutoff points for predicting the presence of metastases. Data were analyzed using Stata statistical software. A value of P < 0.05 was considered statistically significant. All procedures performed in studies involving human participants were by the ethical standards of the Institutional Research Committee and with the principles of the 1964 Declaration of Helsinki and its later amendments. All the bone scans were performed and utilized as part of the routine clinical management of the patients with prostate cancer by the referring clinicians; no new radiopharmaceutical injections were given, and no new images were acquired for this study. A total of 363 patients were included in the analysis. The mean/standard deviation age of the patients was 68.1 ± 7.8 years. Median Gleason score and PSA were 7 (range 4–10) and 30.8 ng/ml (range 2.1–4537), respectively. The characteristics of the study population are enumerated in [Table 1]. Approximately 72% of patients had a Gleason score of ≥7 while 65.5% had PSA >20 ng/ml. The majority (73.8%) of patients were categorized as high risk when the D'Amico classification was applied. Of the 363 patients studied, 96 (26.5%) had metastases, whereas 240 (66.1%) were classified as negative for metastases on the bone scan. Twenty-seven (7.4%) of patients had lesions classified as equivocal for metastases. 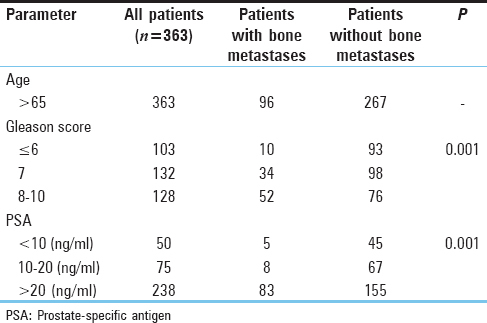 Patients with bone metastases had significantly higher Gleason scores and PSA levels than those without metastases [Table 2] and [Table 3]. Patients with high-risk disease were more likely to have skeletal metastases. Ninety of the 96 patients with metastases had high-risk disease, whereas two and four patients had low-to-intermediate risk disease, respectively (P = 0.0001). The results of the logistic regression analysis to determine whether PSA, Gleason score, and age were independently predictive of bone metastases in this group of West Africans with prostate cancer are detailed in [Table 4]. The analysis revealed that both PSA (odds ratio [OR] 2.4 [95% confidence interval [CI] 1.5–3.8], P = 0.001) and GS (OR 2.2 [95% CI 1.5–3.1], P = 0.001) score were significant independent predictors of the presence of bone metastases. For a unit increase of PSA, the odds of developing bone metastasis increases by a factor of 2.4 while with a unit increase in Gleason score, the odds increase by a factor of 2.2 (P = 0.001). However, patient's age could not predict the presence of metastases on the bone scan. The results of the ROC analysis to determine the sensitivity and specificity of different PSA and Gleason cutoffs to predict the presence of bone metastases is presented in [Figure 1] and [Figure 2], respectively. A PSA cutoff value of ≥10 had a 94.8% sensitivity and only16.9% specificity while a value ≥20 had 86.5% and 41.2% sensitivity and specificity, respectively, for the presence of bone metastases. 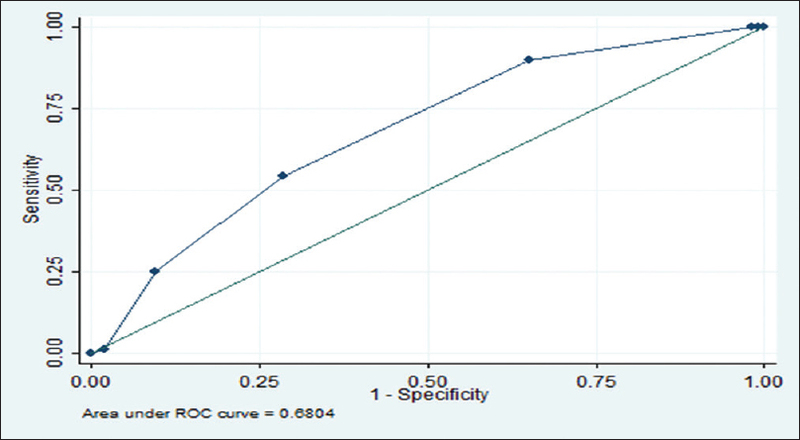 The area under the PSA ROC curve was 0.72 (95% CI 0.66–0.78). A Gleason score of ≥7 had an 89.6% sensitivity and 34.8% specificity for bone metastases. Using a Gleason cutoff of ≥8, the sensitivity and specificity for predicting bone metastases were 54.2% and 71.5%, respectively. The area under the Gleason score ROC curve was 0.68 (implies Gleason score predicts the presence of bone metastases with 68% accuracy) (95% CI 0.62–0.74). Prostate cancer is the most common male cancer worldwide and causes significant morbidity (characterized by pain, impaired mobility, pathologic fractures, spinal cord compression, anemia, retention of urine, and hypercalcemia), and mortality., While there can be a direct extension to surrounding tissues, metastases generally occur via the lymphatics or vasculature (paravertebral Baxton's plexus or caval). Bone is a common site for distant spread. Bone scintigraphy is recommended for initial staging and is more sensitive than plain radiography, CT and serum enzymes such as alkaline phosphatase., While there are no National Guidelines regarding the management of Ghanaian patients with prostate cancer, guidelines from the European Association of Urology recommend that for asymptomatic patients with low-risk disease, the bone scan can be omitted., Although prostate cancer is the most common male cancer in Ghana, a West African country, there has been no previous evaluation of the relationship between the findings at scintigraphy and PSA or Gleason score in these patients. The mean age of our patients was 68.1 years; this is similar to the 69.9 years reported by Ekeke et al. from a study in Nigeria and the 70 years reported by Yeboah et al. in their study from Ghana. In the present study, 96 of 363 (26.5%) had bone metastases similar to the 29.3% found in a study of North Africans by Janane et al. This is, however, higher than the 14% reported by Lee et al. and 4.7% reported from Japan, but lower than the 41% among Kenyan patients reported by Qureshi et al. and the 39.7% reported among Jordanian patients. The higher incidence of metastases in our study compared to the North American and Japanese studies may be due to several factors. There is currently no population-based screening program for early detection. Poor health-seeking behaviors coupled with limited knowledge of the disease, an inadequate number of urologists and the limited number of diagnostic services play a role and contribute to most patients in our sub-region presenting late with advanced disease.,, Patients in the West African region also tend to present with more aggressive tumors. Previous studies have reported that Gleason score and serum PSA are independently predictive of the likelihood of bone metastases.,,, Al-Ghazo et al. reported that in all their patients with Gleason score <8 and PSA ≤20 and clinical T1–T2 disease, the bone scan was negative for metastases. They conclude that a staging bone scan can be omitted in prostate cancer patients with a PSA ≤20 ng/ml and a Gleason score <8. Tanaka et al. in their study of Japanese patients reported the incidence of skeletal metastases at various PSA levels as follows: 0.4% with PSA ≤10 ng/ml, 0.5% in 10.1–20 ng/ml, 4.1% in 20.1–50 ng/ml, 11.1% in 50.1–100 ng/ml, and 41.4% in >100 ng/ml. Using Gleason score, 0%, 2.7% and 16.5% of patients with scores ≤6, 7 and 8–10, respectively, had bone metastases. They conclude that the incidence of skeletal metastases in patients with PSA ≤20 ng/ml and Gleason score ≤6 was reasonably low and therefore suggested that a staging bone scan is not necessary as a routine examination in such patients. In a study of 631 patients, Lee et al. reported that 14% had bone metastases. They found that Gleason score, PSA, and clinical stage were significant independent predictors of the presence of bone metastases on scintigraphy. In addition, they reported that only 1% of patients with Gleason score 2-7, PSA ≤50 and clinical stage ≤T2b had metastases. Among 150 Sudanese patients with prostate cancer, patients with a positive bone scan had a significantly high level of PSA when compared to patients with without metastases. Of the 75 patients with metastases in that study, four patients (2.6%) had PSA serum concentration ≤10 ng/ml, 10 (6.7%) had PSA serum concentration >10–≤20 ng/ml and 61 (40.7%) had PSA concentration >20 ng/ml. In the present study, only 2 of 96 patients (2.1%) with bone metastases had PSA <10 ng/ml and Gleason score <7. The proportion of low-risk patients with bone metastases in our study is similar to the reports by Lee et al. and Khalid et al. In this study, we found that 6 of 96 (6.3%) patients with bone metastases had a PSA <20 ng/ml and Gleason score <8. Only 2 of 96 (2.1%) patients with bone metastases were in the D'Amico low-risk category (PSA <10 ng/ml and Gleason <7) while 4 (4.2%) patients with metastases had intermediate-risk disease (PSA 10–20 ng/ml and Gleason score of 7). Thus the proportion of patients with low-to-intermediate risk prostate cancer who had bone metastases in our West African population is less than reported among East African males by Qureshi et al. In their cohort, Qureshi et al. also found that the prevalence of metastases among patients with PSA >20 ng/ml was 55.9% (95% CI 44.1%–67.7%) and among those with PSA <20 ng/ml was 22.2% (95% CI 11.1%–33.3%). They concluded that a relatively higher prevalence of skeletal metastasis is seen in regional dark-skinned African males with prostate cancer at both low and high PSA levels and therefore recommended that bone scanning in their population should be considered even at PSA levels below 20 ng/ml. In our study, a PSA cutoff value of ≥10 predicted the presence of metastases with a 94.8% sensitivity and only16.9% specificity. With a cutoff value ≥20, the sensitivity and specificity were specificity were 86.5% and 41.2%, respectively. Although a cutoff value of ≥30 predicted the presence of metastases with a lower sensitivity of 72.9%, the specificity was higher at 56.2%, and 60% of cases were correctly classified. 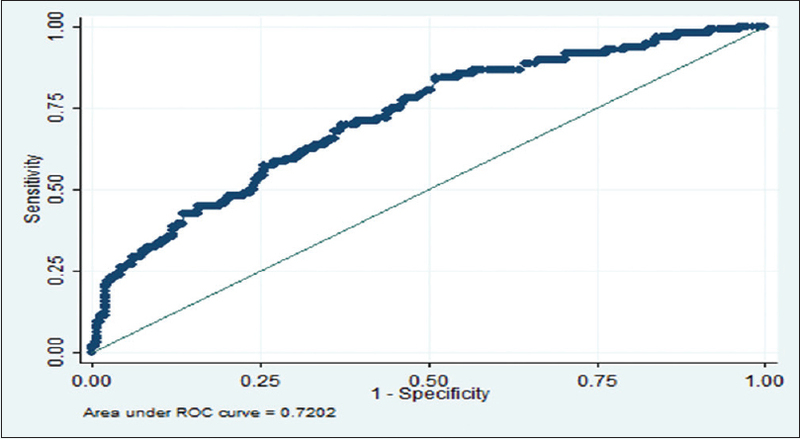 The area under the PSA ROC curve was 0.72 (95% CI 0.66–0.78). A Gleason score of ≥7 had an 89.6% sensitivity and 34.8% specificity for bone metastases. Using a Gleason cutoff of ≥8, the sensitivity and specificity for predicting bone metastases were 54.2% and 71.5%, respectively. The area under the Gleason score ROC curve was 0.68 (implies Gleason score predicts the presence of bone metastases with 68% accuracy) (95% CI 0.62–0.74). Thus, in our West African patients with prostate cancer, both the serum PSA and Gleason score predict the presence of metastases with reasonable accuracy. Our findings in this study are consistent with the evidence and the recommendations for excluding routine staging bone scans among asymptomatic patients with low-risk prostate cancer.,,,, Serum PSA and Gleason score are significant independent predictors of the presence of metastases on bone scintigraphy among Ghanaian patients with prostate cancer. This study has also provided evidence that the incidence of bone metastases is low in patients with low-to-intermediate risk prostate cancer in Ghana. A staging bone scan may not be a requirement in such patients, especially those who are asymptomatic. Coupled with the limited availability of such services in Ghana, avoiding bone scintigraphy in asymptomatic patients with low-risk disease can result in economic savings and more efficient utilization of the limited nuclear medicine services in our developing country setting. This study had some limitations. Only planar images were acquired in the patients. Although our gamma camera is SPECT capable, we have not been able to utilize this function for technical reasons. The addition of SPECT and SPECT/CT may have reduced the number of lesions categorized as equivocal and resulted in more accurate lesion classification. Bone scintigraphy may not be recommended as a routine investigation for the staging of asymptomatic Ghanaian males with low-risk prostate cancer. PSA and Gleason score are independent predictors of the presence of bone metastases in West Africans with prostate cancer. Global Burden of Disease Cancer Collaboration, Fitzmaurice C, Allen C, Barber RM, Barregard L, Bhutta ZA, et al. Global, regional, and national cancer incidence, mortality, years of life lost, years lived with disability, and disability-adjusted life-years for 32 cancer groups, 1990 to 2015: A systematic analysis for the global burden of disease study. JAMA Oncol 2017;3:524-48. Calys-Tagoe BN, Yarney J, Kenu E, Amanhyia NA, Enchill E, Obeng I, et al. Profile of cancer patients' seen at Korle Bu teaching hospital in Ghana (a cancer registry review). BMC Res Notes 2014;7:577. Laryea DO, Awuah B, Amoako YA, Osei-Bonsu E, Dogbe J, Larsen-Reindorf R, et al. Cancer incidence in Ghana, 2012: Evidence from a population-based cancer registry. BMC Cancer 2014;14:362. Halabi S, Kelly WK, Ma H, Zhou H, Solomon NC, Fizazi K, et al. Meta-analysis evaluating the impact of site of metastasis on overall survival in men with castration-resistant prostate cancer. J Clin Oncol 2016;34:1652-9. Pyka T, Okamoto S, Dahlbender M, Tauber R, Retz M, Heck M, et al. Comparison of bone scintigraphy and68 Ga-PSMA PET for skeletal staging in prostate cancer. Eur J Nucl Med Mol Imaging 2016;43:2114-21. Langsteger W, Rezaee A, Pirich C, Beheshti M.18 F-NaF-PET/CT and99m Tc-MDP bone scintigraphy in the detection of bone metastases in prostate cancer. Semin Nucl Med 2016;46:491-501. Bouchelouche K, Choyke PL. Prostate-specific membrane antigen positron emission tomography in prostate cancer: A step toward personalized medicine. Curr Opin Oncol 2016;28:216-21. Bouchelouche K, Turkbey B, Choyke PL. PSMA PET and radionuclide therapy in prostate cancer. Semin Nucl Med 2016;46:522-35. An H, Tao N, Li J, Guan Y, Wang W, Wang Y, et al. Detection of prostate cancer metastasis by whole body magnetic resonance imaging combined with bone scintigraphy and PSA levels. Cell Physiol Biochem 2016;40:1052-62. Lee N, Fawaaz R, Olsson CA, Benson MC, Petrylak DP, Schiff PB, et al. Which patients with newly diagnosed prostate cancer need a radionuclide bone scan? An analysis based on 631 patients. Int J Radiat Oncol Biol Phys 2000;48:1443-6. Abuzallouf S, Dayes I, Lukka H. Baseline staging of newly diagnosed prostate cancer: A summary of the literature. J Urol 2004;171:2122-7. Tanaka N, Fujimoto K, Shinkai T, Nakai Y, Kuwada M, Anai S, et al. Bone scan can be spared in asymptomatic prostate cancer patients with PSA of <=20 ng/ml and Gleason score of <=6 at the initial stage of diagnosis. Jpn J Clin Oncol 2011;41:1209-13. Al-Ghazo MA, Ghalayini IF, Al-Azab RS, Bani-Hani I, Barham A, Haddad Y, et al. Do all patients with newly diagnosed prostate cancer need staging radionuclide bone scan? A retrospective study. Int Braz J Urol 2010;36:685-91. D'Amico AV, Whittington R, Malkowicz SB, Schultz D, Blank K, Broderick GA, et al. Biochemical outcome after radical prostatectomy, external beam radiation therapy, or interstitial radiation therapy for clinically localized prostate cancer. JAMA 1998;280:969-74. Van den Wyngaert T, Strobel K, Kampen WU, Kuwert T, van der Bruggen W, Mohan HK, et al. The EANM practice guidelines for bone scintigraphy. Eur J Nucl Med Mol Imaging 2016;43:1723-38. Donohoe KJ, Henkin RE, Royal HD, Brown ML, Collier BD, O'Mara RE, et al. Procedure guideline for bone scintigraphy: 1.0. Society of Nuclear Medicine. J Nucl Med 1996;37:1903-6. Macedo F, Ladeira K, Pinho F, Saraiva N, Bonito N, Pinto L, et al. Bone metastases: An overview. Oncol Rev 2017;11:321. Mottet N, Bellmunt J, Bolla M, Briers E, Cumberbatch MG, De Santis M, et al. EAU-ESTRO-SIOG guidelines on prostate cancer. Part 1: Screening, diagnosis, and local treatment with curative intent. Eur Urol 2017;71:618-29. Ekeke O, Amusan O, Eke N. Management of prostate cancer in Port Harcourt, Nigeria: Changing patterns. J West Afr Coll Surg 2012;2:58-77. Yeboah ED, Hsing AW, Mante S, Mensah JE, Kyei MY, Yarney J, et al. Management of prostate cancer in Accra, Ghana. J West Afr Coll Surg 2016;6:31-65. Janane A, Jawad C, Hajji F, Ould T, Ghadouane M, Ameur A, et al. Bone scan findings in a North African Ethnic Group and relation to PSA level and gleason score of the biopsy. Actas Urol Esp 2011;35:534-9. Qureshi AM, Makhdomi K, Stones W. Prostate-specific antigen as a risk factor for skeletal metastasis in native ethnic African men with prostate cancer: A case-control study. World J Nucl Med 2017;16:26-32. Rebbeck TR, Devesa SS, Chang BL, Bunker CH, Cheng I, Cooney K, et al. Global patterns of prostate cancer incidence, aggressiveness, and mortality in men of African descent. Prostate Cancer 2013;2013:560857. Khalid KE, Brair AI, Elhaj AM, Ali KE. 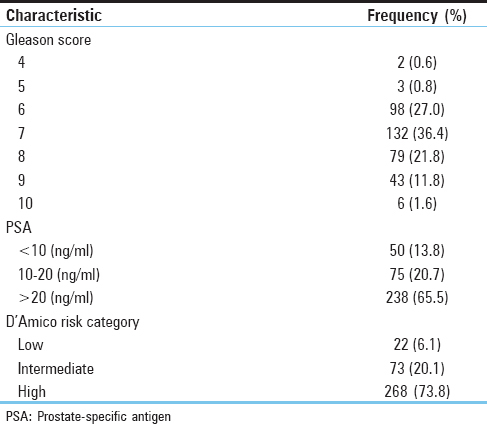 Prostate-specific antigen level and risk of bone metastasis in Sudanese patients with prostate cancer. Saudi J Kidney Dis Transpl 2011;22:1041-3.